Ryn and Levi are now on a multi-dimensional hunt for Ezra (Ryn's boyfriend), who Levi pushed through the Rift and who happens to be carrying information vital to the success of the uprising begun in the first book of the Rift Uprising series. Used to defending their side of the Rift from dangerous incoming travelers, Ryn and Levi don't really know what they will find as they jump from Earth to Earth following Ezra's quantum signature. Will Ryn and Levi be able to work together despite their rivalry? Will they ever find Ezra? And will he still be in one piece if they do? Amy Foster writes the kind of stories that grab readers by the face and demand they keep turning pages until the wee hours of the night. The Rift Frequency is testament to that. I couldn't wait to see what kind of Earth Ryn and Levi would end up on next and what the challenges might be. It actually reminded me a bit of the late-90s TV show Sliders the way they kept moving between different versions of Earth, though at least Ryn and Levi had the technology to be a little more in control of how quickly they could leave a particular version of Earth. With as many other pop-culture references that Foster throws into the book, I was really expecting a Sliders or Jerry O'Connell shout out somewhere along the line! Another thing at which Foster consistently excels is hitting essential truths in a way that is accessible for the young adult audience. There is a scene early in the book in which Ryn wonders whether her face will be scarred for life and kind of wishes that she had more physical scars to reflect the social and emotional damage that has been done to her. We, as humans, often carry pain in our hearts. That desire to be able to connect normally with others without having to explain our personal traumas repeatedly is so strong and such a part of the teenage experience (though many of us don't recognize it until later in life). Another scene, on an Earth of humanity's "descendants," touches on how there can be nearly insurmountable conflicts of interest even when both parties are "good guys." Foster is just so good at letting things be complex in a truthful way. I have to admit though that I did not love the second half The Rift Frequency. So much of the story from that point on revolves around the growing attraction between Ryn and Levi, and I just did not like the whole love triangle scenario. Foster even goes so far as to have Ryn lament that she doesn't want to be that girl in the apocalyptic situation who over focuses on which boy she should be with. But then Foster doesn't have Ryn back away from that triangle despite being one of the strongest female protagonists out there. Which could be seen as realistic teen behavior, I suppose, but I guess I wanted more from a character with a genetically enhanced brain. 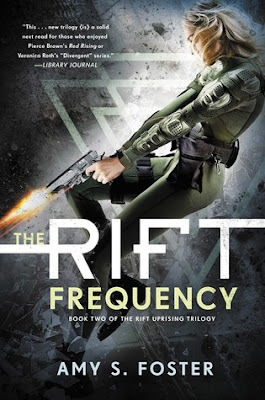 Overall, The Rift Frequency is an engaging read, and I look forward to reading the final book of the trilogy to find out what will happen to our Earth. Note: The Rift Frequency has a fair amount of strong language.